The exhibition Women Who Shaped Manchester captures the spirit and courage of women who helped shape the city as we know it today. Running until 10th March at the John Rylands Library, the exhibition features exceptional female figures from the early 1900s. The sepia-tinted correspondences, documents, and photographs on display from the library’s archives emphasise the dedication these women had to their causes. Follow the stories of the library founders, the mill workers, the pioneers of education and health. Similarly, you can join the protestors campaigning for women’s suffrage. The exhibition allows you to immerse yourself in the world and struggles of many astounding female figures. Enriqueta Augustina Rylands founded the John Rylands Library in memory of her husband, John. Originally intended to be a theological library, it opened to the public in 1900 as a gift to the city. This provided the people of Manchester with a world-class literary resource. The Victorian neo-Gothic library situated on Deansgate was a unique space in the heart of a bustling industrial city, and remains a landmark today. As a result, The Manchester Corporation recognised it as an extraordinary asset to the cultural wealth of the city, with Enriqueta’s impact on the betterment of the city also recognised by being awarded the Freedom of the City scroll. The scroll, on display at the exhibition, symbolically depicts the Manchester worker bee and the lamp of enlightenment, stressing the importance of her legacy. Manchester is home to the suffragettes. Although women had been campaigning for the right to vote for many years before, Emmeline Pankhurst, along with her daughters, Christabel and Sylvia, demonstrated their activism through deeds. In 1903, they established the Women’s Social and Political Union (WSPU) and were repeatedly imprisoned for their political protests. Emmeline Pankhurst’s passionate letter from 1910 is on display, in which she calls on women to make the ultimate sacrifice for equality. She writes about the death of her young sister, who had been force-fed in Holloway Prison. The WSPU used hunger striking, in addition to stone-throwing, window-smashing, and arson as political tactics. Manchester is a city with a radical political history and the Pankhursts weren’t the only active women in the city; they inspired University students to march through Manchester in October 1908, engaging with the suffrage debate. With regards to education, Mabel Tylecote studied and later lectured in the University of Manchester’s History Department. She wrote The Education of Women at Manchester University 1883-1933 to commemorate the 50th anniversary of the University accepting female students. Tylecote worked for social reform and was a leading figure in Manchester’s political and civic life for years. Her main passion was adult education. Consequently, she fought to provide educational opportunities for people who would otherwise be denied them. Furthermore, Madeline Linford launched the Manchester Guardian’s women’s page in 1922. Regarded as one of the most remarkable newspaperwomen of her time, her successful journalistic career has inspired female journalists today. Despite her personal success, Linford remained the only female editor for 25 years. Her story displays the strength of opposition to female ambition. Various articles from the newspaper are on display, as well as a photograph of the editorial team dated 1921. Gaining an invaluable insight through original artefacts into a black and white world is key to understanding the impact of these women had on the wave of progress. 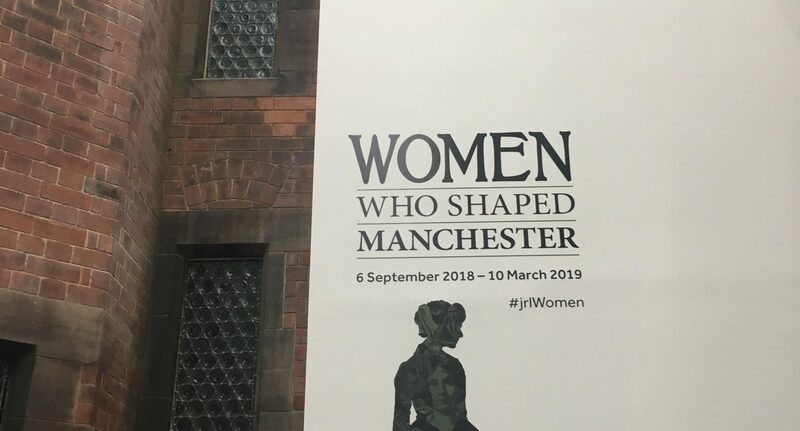 Visit the exhibition to discover more influential figures, including those who worked tirelessly to construct a Manchester for women of the 21st century. What will the extraordinary women of Manchester’s past inspire you to do?